It was a great night to be a fan of the Lincolnwood Lancer volleyball team. 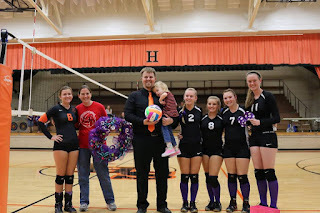 After honoring four senior players and their families, the team quickly defeated rival Staunton in just two games. With a 31-3 record this season, these Lady Lancers have proven to be one of the best teams in school history. 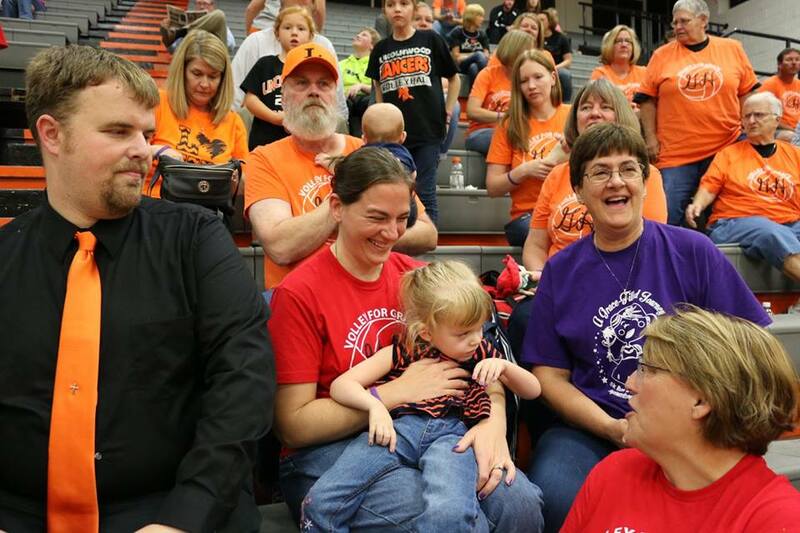 Those Lady Lancers sure do LOVE Grace! 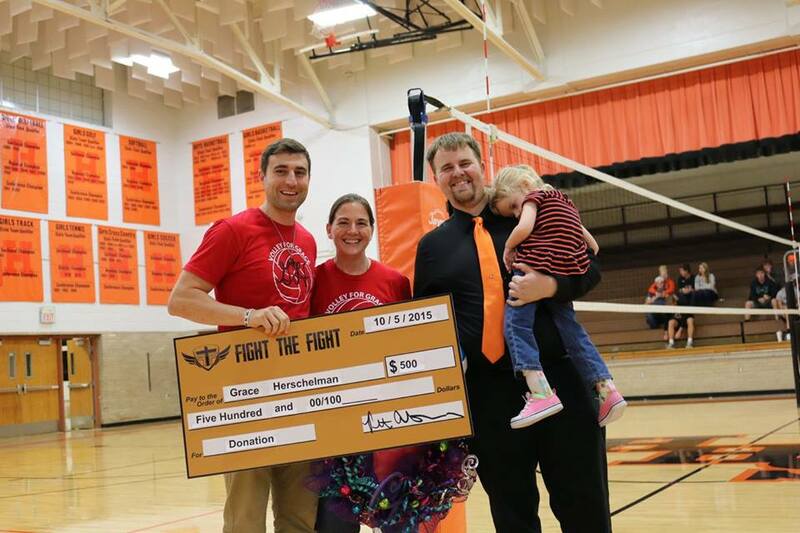 Senior team members presented Grace with a check from this year's Serving for Grace fundraiser. However, it's their success off the courts that makes their story even more special. 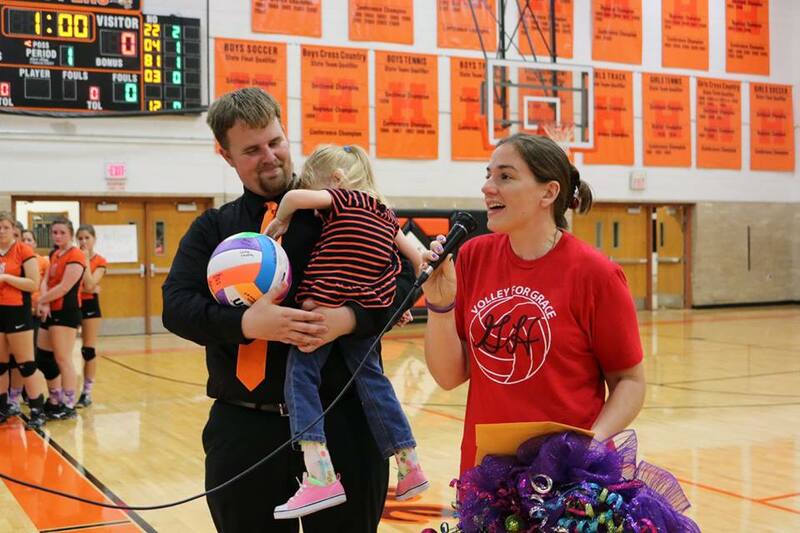 Earlier this year, Lincolnwood volleyball coach Kimberly Denney was one of the very first to reach out to us about honoring Grace at a junior high volleyball game. 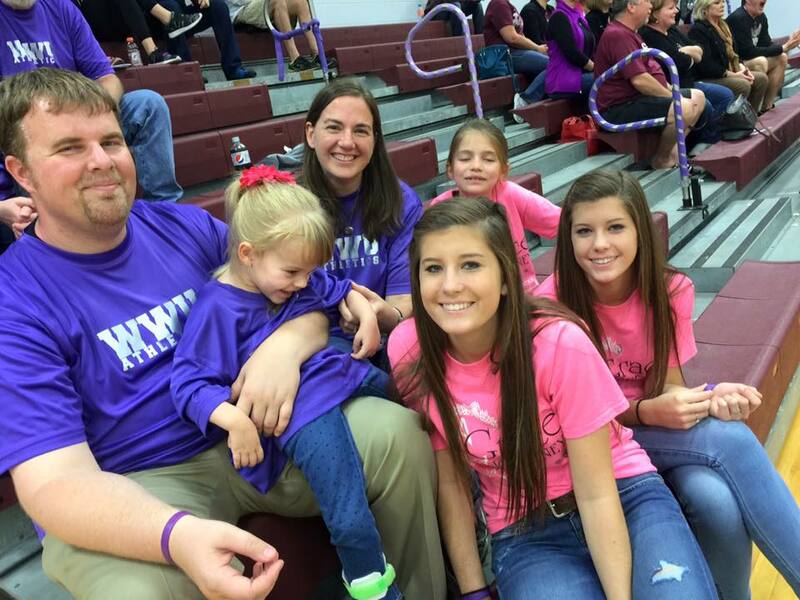 Kyle's cousins, Kayley and Kensey Armour, were eighth graders on the team, which made it extra special. 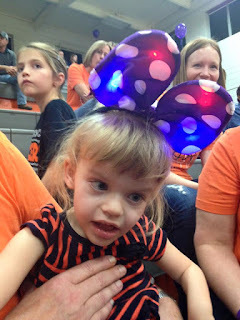 The team presented Grace with her very own Lancer gear, as well as some Disney princess presents. The teams also hosted "Serving for Grace" fundraisers at all their home games to raise money for the INAD study. Although we didn't get to as many games as we had hoped, it was still such a special season for us. 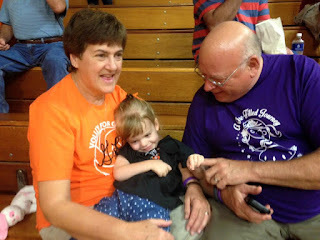 Grace had fun hanging out with Grandma and Grandpa Galer at the game. When the high school season started this fall, Coach Denney told Kyle they were planning the Serving for Grace fundraisers again, and we made plans to attend senior night on Oct. 22. One thing that's been really neat about all the Volley for Grace nights is that Lincolnwood has always been there. 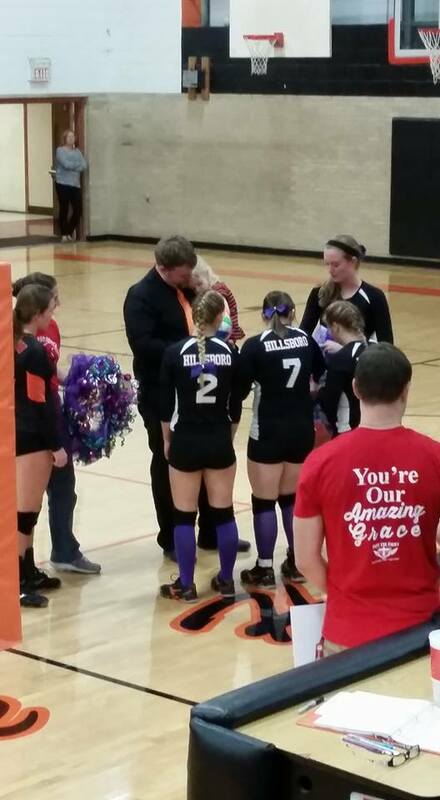 They were the opposing team at both Morrisonville and Hillsboro, and have always been there to support us. Kayley and Kensey are now freshmen, so we have enjoyed cheering them on as well. A special hug from Coach Denney. Although we are almost always late, we tried to arrive to the senior night game in time to see the Armour twins take the court in the JV game. It will be fun to watch them over the next several years. Then, the three of us were invited to center court between games for a special presentation. 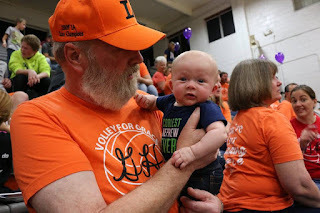 Kyle and I were again wearing our Fight the Fight Volley for Grace shirts, and Grace wore her special Lincolnwood and Hillsboro softball shirt from a game earlier this spring. The first graders at Farmersville Grade School giving Grace their check. Coach Denney shared a little bit about the love the Lincolnwood family has for Grace, which started when Kayley and Kensey shared her diagnosis with their team last winter. The coach added that the volleyball team is also a family that shares its ups and downs with other team members, and are glad to see the love Kayley and Kensey have for Grace. She also said the school has a huge heart for Grace's dad, who is a Lincolnwood alumnus, and covers all of the school's sports teams week in and week out. "So what do you do when you love someone and they are hurting or need help?" Coach Denney asked. "You give them a hug, words of encouragement, and then go to battle to help them." Meeting the fifth graders from Raymond Grade School. We are so grateful to our friends at Lincolnwood that continue to fight this fight with us each and every day. In addition to the Serving for Grace fundraisers throughout the volleyball season, the entire school district hosted a penny wars competition, where the winning class in each school got to present Grace with a check tied to a purple balloon. 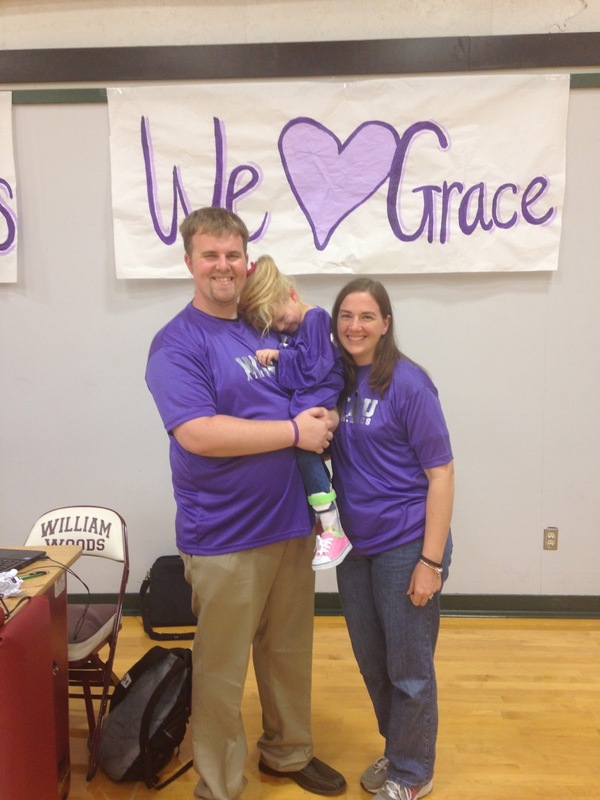 Coach Denney said they would continue to raise awareness and funding for INAD research throughout Grace's journey. She added that the penny wars competition also sparked discussions outside school about putting the needs of others ahead of their own. Grace got a very special hug from Coach Denney's son, Justin. 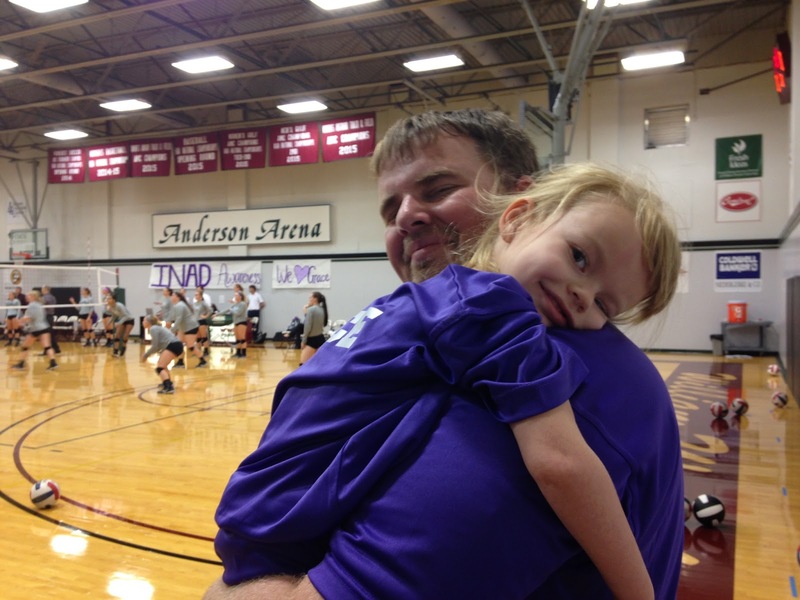 "In my own home, we had a conversation about the limitations of money because my own son asked how many pennies it would take for Grace to get better," Coach Denney said. "He would have given his entire bank account to make that happen." Although I usually manage to stay pretty composed during the Grace events, it was that comment that caught a few tears sneak down my cheeks. We have been touched over and over again by this community's generosity and the love they share for Grace. Coach Denney said that empathy for others is one of the greatest gifts Grace has been able to share with her community, and it's something we can all take a lesson in. Cousins Kayley and Kensey got to present the check from the junior and senior high school. One by one the classes brought checks to Grace. 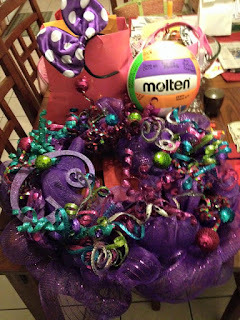 First is was the senior volleyball players and their Serving for Grace money. Then came the first grade students from Farmersville Grade School. At Raymond Grade School, it was the fifth grade class, including Coach Denney's son, Justin, who gave Grace a big hug after he presented the check. At the junior high and high school, it was Kayley and Kensey's first hour class that raised the most. I think they made sure they were the ones that got to give the check to Grace. 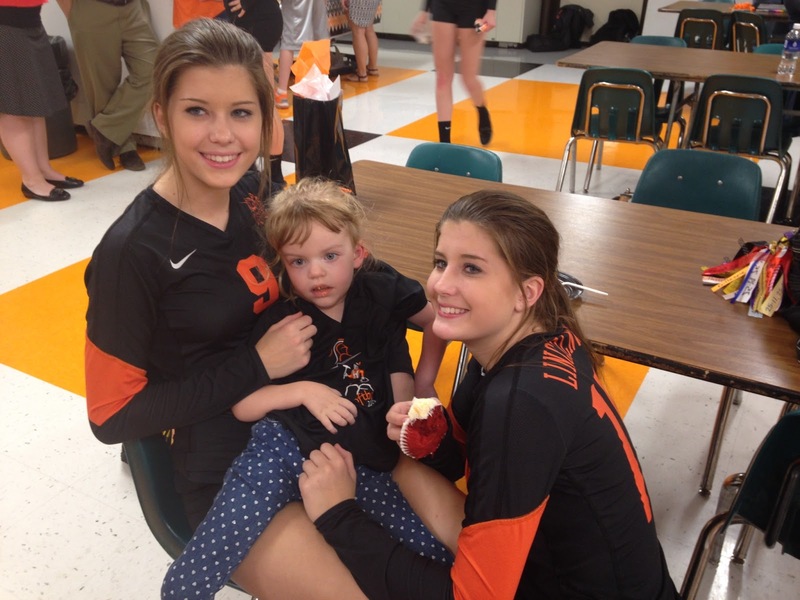 Kayley and Kensey made sure Grace got a cupcake after the game too! All in all, we brought home nearly $3,000 for the INAD research study last Thursday night. It's a true gift that will not only help Grace but kids battling INAD now and in the future. With such kind and giving hearts, we know we will find a way to #beatINAD. I would be the first to admit that I don't often wear much jewelry. And though the pieces that I wear bring a sparkle to my eye, I'm definitely not one for "bling." Every day, I wear my wedding ring on my left hand and my Gracelet on my right hand, a constant reminder that I keep praying for a miracle for Grace. Other times, I wear a couple of bracelets on my left hand, a Pandora bracelet with hand-picked charms and a leather bracelet with the serenity prayer, given to me by one of Grace's physical therapists last Christmas. Some days, I remember earrings, and many have been given to me as special gifts over the years. But I'm most fond of necklaces. Again, they don't offer a lot of sparkle, but I think they shine. There's the diamond cross necklace that my godmother, Helen Cox, gave me for Christmas one year, which has always been one of my favorites. And Kyle gave me a heart shaped necklace as a wedding present. I tried to wear both of them every day, but inevitably, the chains get tangled, and it's a mess to get apart. 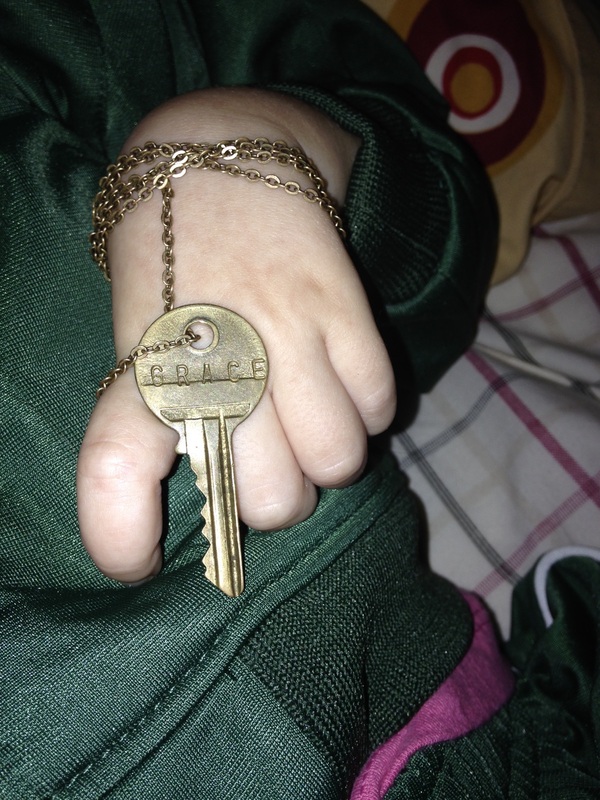 This is Grace holding my special key necklace. So, I usually pick one or the other, and both serve as special reminders of how blessed I am each and every day. Because I am so blessed, I have been given several necklaces since Grace was diagnosed with INAD last year, each unique in its own way. The first is actually a Scrabble tile that was re-purposed as a necklace with what's become one of my favorite scripture verses. "She is clothed with strength and dignity, and she laughs without fear of the future." Proverbs 31:25. It was given to me by Litchfield teacher Susan Bennett, and whenever I have hard times, I think about Grace's smile and her laugh, and try my best not to worry about what the future holds. My next gift came in the mail, and everyone knows how much I love mail. It came all the way from Washington state. Former Hillsboro resident Marie Joy had picked up a handmade necklace out west, and the name of the piece was "grace." It's unique style reminds me of just how unique Grace truly is. One day when I came to work, there was an envelope on my desk with a special note from Kim Noyes. She found a necklace on one of their trips to Branson that said "Believe in Miracles" and she wrote that she thought of me when she saw it. That one's pretty self explanatory. So, now I rotate necklaces on a more regular basis, but each reminds me of my sweet Grace. In the past month, I've added a new piece to my collection, which is by far the most unassuming. It's just a key on a chain. The key has been inscribed with the word "grace," but it's not the key that makes the story so special, it's the story itself. Kyle was covering sports one night, and I asked a family friend, Betsy Homa, if she was free to go on a walk with Grace and I. It was a pretty evening, and I was looking for some company. I've known Betsy for as long as I can remember, after all, she was one of my very first babysitters. She's even been known to fill in a time or two as a babysitter for Grace. As we started out on our walk, we drifted from topic to topic, talking about her kids, Grace's therapy, the paper, and just about anything you could think of. Then Betsy told me she had something for me. She said her daughter, Katie, had it made for her after she heard about Grace's diagnosis, and she's been wearing it every day since then. In a day and age where you can order just about anything you could ever dream of on the internet, this key has a unique story. It was made by a company called The Giving Keys. Singer and songwriter Caitlin Crosby began wearing an old New York City hotel room key around her neck while she was on tour. She had the idea to start engraving old, used keys with inspirational words. Crosby realized that in a way, we are all like these keys, unique, flawed, scarred and sometimes discarded by others, and she wanted these keys to have their purpose renewed. Shortly after, she added a charitable mission to The Giving Keys, when she met Rob and Cera sitting under a tree on Hollywood Boulevard with a sign that read "Ugly, Broke, Hungry." When Crosby found out that Cera made jewelry, she asked the couple to be her business partners. Homeless when they met Crosby, the couple now own their own home in San Diego, where they are employed. The company's mission is to help those affected by homelessness by putting them to work. They have partnered with several organizations around the country giving people a second chance at life. The Giving Keys are now carried in more than 1,200 stores nationwide and available on their website. Old keys have been given new life with inspirational words, and keys may also be personalized. And while this story is amazing enough, it doesn't stop there. They encourage those who purchase the keys to pay it forward as well. "Embrace your word, then pay it forward to a person you feel needs the message more than you." The givers are then encouraged to share their story on the company's website. When Betsy took off her key to give it to me, she told me she had it for awhile, and just hadn't found the right time to pass it along. Our walk that night proved to be the perfect time, and I think we both shared some tears at its meaning. For now, I wear the key proudly, for Grace, each and every day. One day, I hope to pass it along to her as part of her story, and the impact she makes in so many lives, but most of all mine. To learn more about The Giving Keys or to share a story, visit www.thegivingkeys.com. Just days before she passed away, Alexis shared a quote on her Facebook page, "I don't know how my story will end, but nowhere in my text will it ever read, I gave up." And I can't think of any better words to remember Alexis Ann Wernsing. Alexis came to see Grace at the Raymond 5K event this summer. She brought a University of Illinois hat for her to wear, and I begrudingly agreed. Alexis could always talk me into almost anything. She and Grace were truly kindred spirits, and we will sure miss that sweet smile. My first encounters with Alexis were when I returned home to work at the newspaper. The Litchfield Post Office was renovating to become more handicapped accessible, and her dad arranged an interview for me. I have to admit, I was a little intimidated to talk to Alexis at first, but that lasted only a few seconds before she made me feel right at home. She graced the pages of our newspaper many times as a champion for those of all abilities. Although doctors told her parents she wouldn't live to be a teenager, she celebrated her 40th birthday this year, a graduate student at the University of Illinois. But it was through my Grace that I really got to know Alexis, not just for her accomplishments, but for her endless kindness and compassion, and her wonderful, loving heart. Alexis was one of the first to ask for a Gracelet. She wrote mom and asked if she could send her one in Champaign. She was also the very first one to order "A Grace-filled journey" shirt this summer, and I know wore it proudly ever chance she got. As she began to follow Grace's story and our blog, she was a constant source of encouragement for both Kyle and me. This summer, when Kyle didn't finish the Big Dawg Dare, it was Alexis's comment that touched him the most. "From 40 years of God-given experience, trust me Kyle Herschelman when I tell you the very best lesson and example you will teach and be for Grace is to know and trust her limitations. Give it your best every day, but stop when your body tells you. The entire community is honored to be a part of your family, without you finishing the Big Dawg Dare." Alexis has overcome more adversity in her lifetime than any one of us could ever imagine. And she never complained about any of it. She wanted to be challenged in school. She wanted to learn everything she could. And she wanted to make a difference. My friend, you made such a difference in our lives. She was constantly remembering Grace. Her mom dropped a hockey puck by the office one day that one of the ushers had given her at a Blues game. We put it on Grace's dresser. After we wrote a blog about ladybugs, she found a ladybug bank for Grace (also now sitting on her dresser). Alexis and Grace were kindred spirits, right down to their love of sweets. Mom, Grace and I were truly blessed that Alexis and her mom joined us for ice cream this summer. She was getting ready to go back to college, and we loved hearing her excitement and enthusiasm. That's perhaps why I was so surprised to hear she had passed away. The week before her death, we had run a story in the paper, first published at the University of Illinois about a new project that would amplify her voice. She had contacted me to see if we could run it in the paper here, and was most excited they let us use the photo too. "It's the best picture I think I've ever taken," she wrote. The following week, she texted me to thank me for running the article. I told her it was my pleasure and that mom would drop some extra copies by her dad's store. She told me that unfortunately her journey this year had taken her home for the semester. However, always the optimist, Alexis texted she hoped that meant lunches with Grace at the Ariston and maybe even a chance to watch Frozen together. I thought it sounded like fun. And just like that she was gone. Not even a chance to say a proper goodbye. But Alexis would probably have been the first to tell me it was all part of God's plan. Many times she shared her favorite verse of scripture on Facebook, "For I know the plans I have for you,” declares the Lord, “plans to prosper you and not to harm you, plans to give you hope and a future." That's long been a favorite verse of mine as well, and just goes to show that we need to keep our faith where it matters the very most. I may never understand some things in this lifetime, but I know who holds my future. And I'm so grateful that Alexis reminded me of that. After she passed away, her Facebook wall was full of photos and kind words from friends and family, whose lives she had touched over the years. Alexis wanted to be an art professor and was working toward that goal. Her dad told me that she will indeed still receive her degree from the University of Illinois as she had enough credits to graduate. Although she never actually saw her teaching diploma, Alexis was probably the best teacher any of us will ever meet. Some of her life lessons to me include always show kindness, never give up, have faith, trust in God and a smile can make anyone's day brighter, even your own. 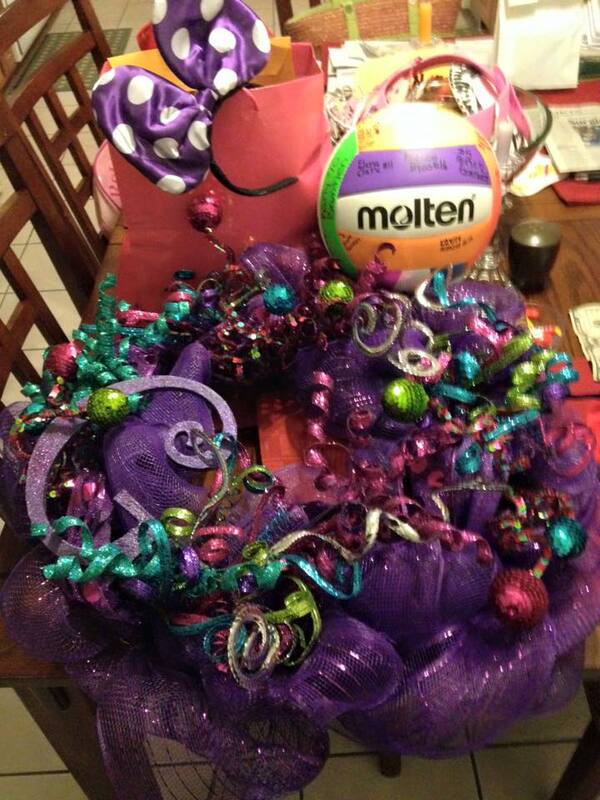 We were so honored that some of the memorials from her funeral will go to the INAD study in honor of Grace. Alexis reminded me each and every day to always keep going, even when I think it's too hard. For me, it goes back to that quote,"I don't know how my story will end, but nowhere in my text will it ever read, I gave up." To my dear friend, Alexis, thanks for always reminding me to never give up. I will keep on, for you, for Grace and for all those who need me. You will always be missed. Thanks for being part of our Grace-filled journey. It wouldn't have been the same without you. 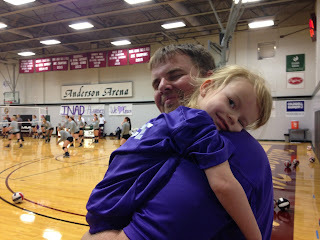 In her first college starts, Grace is officially 2-0, and she loved every minute of it. 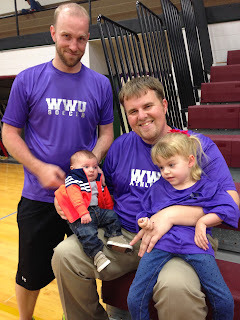 With a little help from Uncle Daniel and Aunt Monica, Grace officially became a William Woods University Owl this weekend, getting an honorary start for both the women's soccer and volleyball teams. 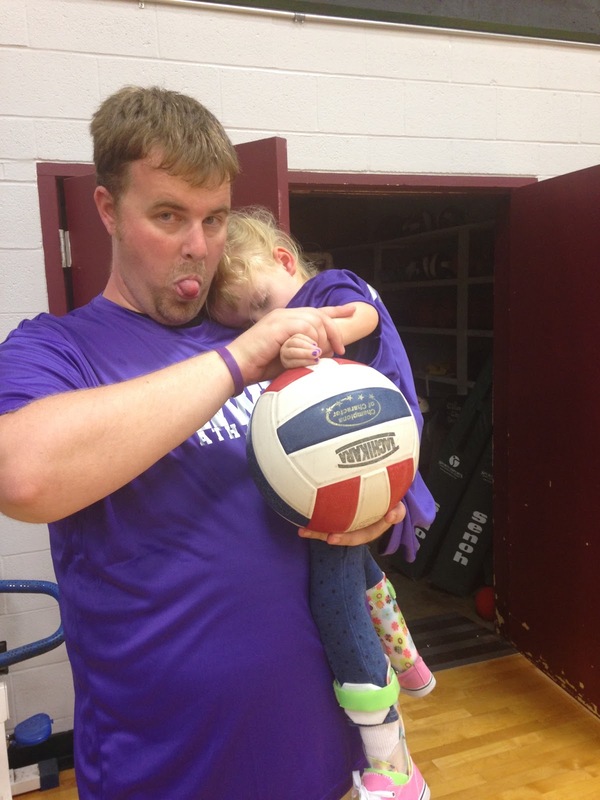 Aunt Monica is the head volleyball coach for the Owls, based in Fulton, MO, and Uncle Daniel volunteers with the women's soccer program. Grace was the honorary starter for both the William Woods University women's soccer and volleyball teams this weekend. A few weeks ago, Kyle texted Daniel to see if he thought Monica would be interested in hosting an INAD awareness game. But as it turns out, Monica and Daniel already had that in the works! They were just finalizing a few details. Kyle and I are really hoping to raise more awareness about INAD in the coming weeks and months, and have a few more ideas up our sleeves too. Grace was all smiles with cousin Keelen before the game. We got more and more excited as the weekend drew closer, until we were finally on our way across I-70 headed for Fulton on Saturday, Oct. 10. Although it's a route I know well from my Mizzou days, Kyle and I hadn't made that trip in several years. It still takes every bit of three hours to get there. It was fun getting to meet the women's soccer team! 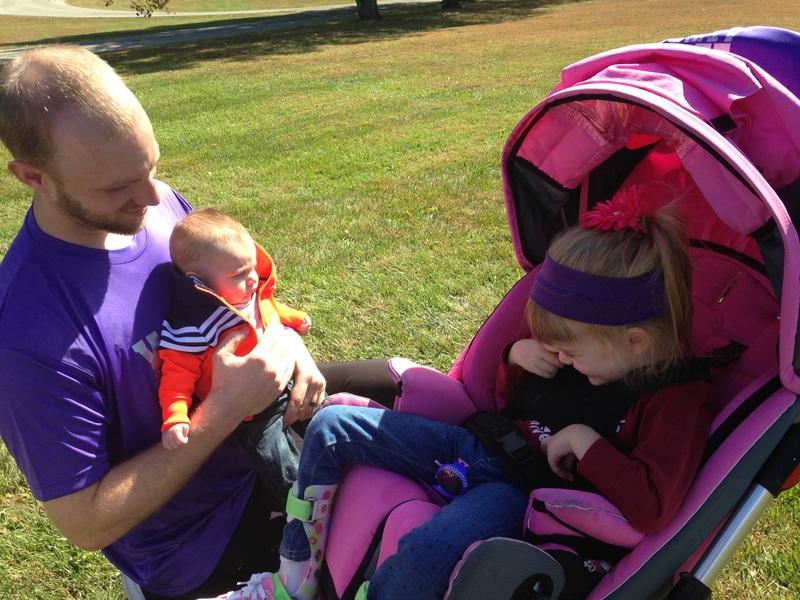 We arrived at the William Woods University soccer field around lunchtime, where the two teams were hosting a tailgate luncheon as part of the fundraiser. They had hamburgers and brats, potato salad, cole slaw and several chocolate desserts made by Aunt Monica. Needless to say, those were Grace's favorites. She even had a piece of Texas cake for breakfast on Sunday before we headed home. Chilling out during the game with daddy, grandma and Kayley. 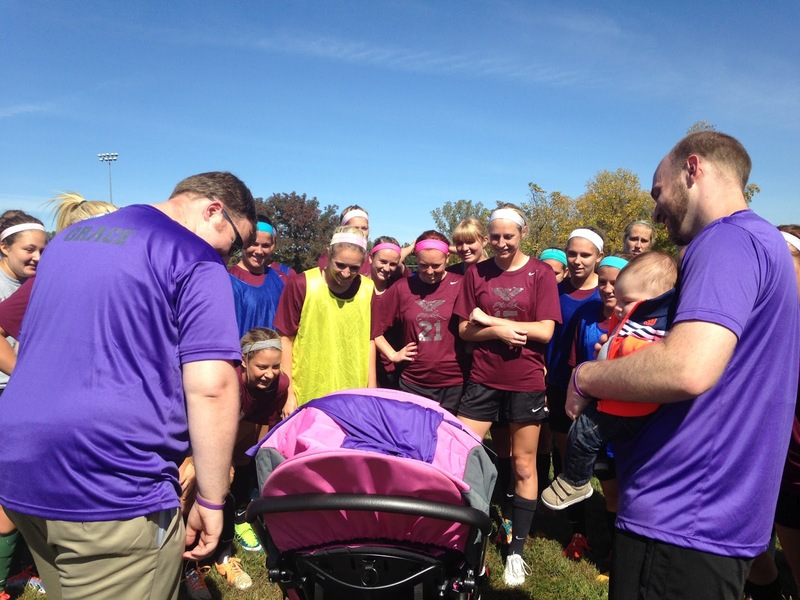 Before the game started, we took Grace down to meet the soccer team. She enjoyed a few "fist bumps" with some of the players, and just loved all the attention they gave her. She also had lots of smiles for cousin Keelen, who we hadn't seen since the Grace race. Mommy even got some baby snuggles later on. 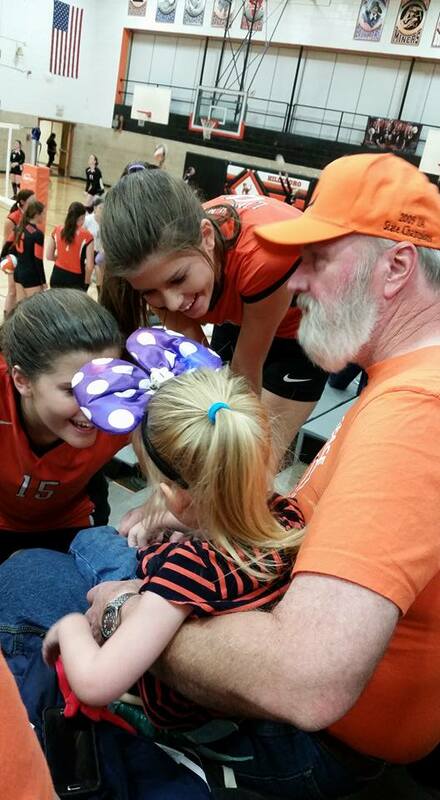 Grace loved her fan section during the volleyball game as well. We also had a chance to pose for a photo with all the team members from both the soccer and volleyball teams inside the goal. 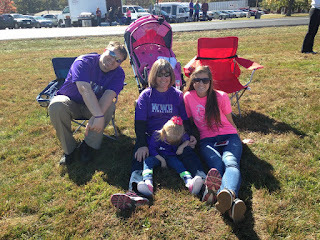 It was a sea of purple as Aunt Monica made shirts for everyone to wear, and I was so excited to get a new Grace shirt. They shirts say William Woods athletics and Grace on the back. It was really neat to watch both games and see Grace's name on the back of all the players' shirts. 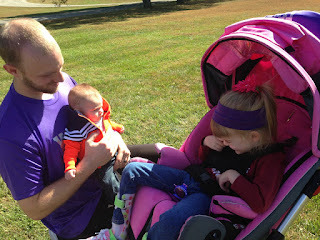 Aunt Monica even found a purple headband for Grace to wear. Then Grace was invited down to the field to be part of the starting line-up. Each player's name was announced and at the very end, Grace was announced as an honorary starter for the team as part of the Goals for Grace event. In addition to the tailgate, soccer fans could pledge to donate an amount for each goal scored by the William Woods team that day, and all proceeds would go to the INAD study. The final score was 3-1. Grace was all smiles during the starting line-up. As we settled in to watch the game, we noticed a few other familiar faces in the crowd, besides Grandma and Grandpa Herschelman. Aunt Angie Armour and cousins Kayley, Kensey and Katelyn made the road trip for the day as well in their pink Grace shirts. It was fun to visit with everyone as we cheered on the Owls. After loading up the tailgate supplies, it was time to head to the gym for the volleyball game. The purple continued as we entered the gym. We quickly saw large banners that read "INAD Awareness" and "We Love Grace" in purple letters. 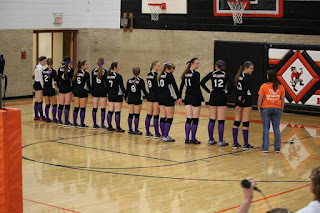 There were also purple streamers at the entrance to the gym and wrapped around all the poles in the bleachers. We took a few photos, and then had a chance to visit with the players' families. One mom even worked at Washington University, so we were excited to share our experiences there. 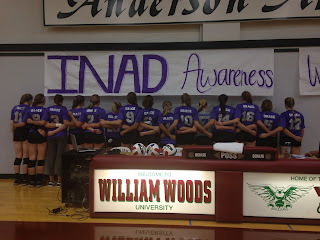 After the game, the volleyball team posed under the INAD awareness banner. As the warm-ups wrapped up, Grace was once again called to the floor to be part of the starting line-up. I was holding her with her head snuggled on my shoulder, but she really wanted to see and be part of what was going on, so I turned her around. 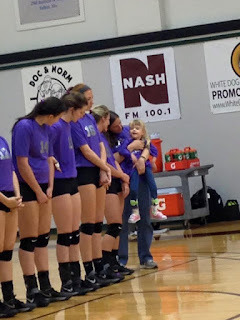 She loved talking and smiling to the girls and even got to be part of the huddle. As they broke apart, they yelled "For Grace!" I found myself a little teary eyed as we made our way back to the bleachers. We sure do LOVE Grace! We really enjoyed watching the game and the Owls win in three straight games. Since Fulton is a bit of a drive, we've only had a few chances to see Aunt Monica's team play. Grace was just a baby when they played in Springfield, and it was fun to watch her team in action again. Grace had a great time practicing spiking the volleyball with daddy. She giggled the whole time! As the final whistle sounded, Grace posed for a few more photos with the team and headed back to Aunt Monica and Uncle Daniel's new house for some pizza and a pajama party. Kyle even took a photo of cousin Keelen wearing a gracelet. 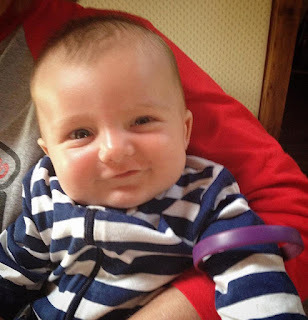 Cousin Keelen is all smiles wearing his gracelet. Before we left, Monica said she thought the events raised between $600 and $700 for the INAD study at Washington University, which is super exciting. We feel so fortunate to be able to contribute to this study and the future of the INAD children, through the generosity of each and every donor. Thanks to everyone who joined our "Grace-filled journey" this weekend. We will never forget it. What a beautiful day for a trip to the apple orchard. Grace's daddy found her a "shiny" apple on the preschool class field trip. This week, Kyle and I took a day off of work to join Grace and her classmates on a field trip to Broom's Orchard in Carlinville. Grace and her classmates learning about how apples are picked from the trees. For once, we were on time to school, meeting several of the families at church before making our way to the orchard. When we arrived, Grace was really excited to see her friends from both the morning and afternoon classes. Many of the kids in this year's afternoon class were in her class last year. Grace really liked seeing Mia and her family. Mia was in Grace's class last year. The morning class got to take the tour first while the afternoon class played on the playground. One of the employees started the tour at a photo of Johnny Appleseed and told the students about how he traveled the country planting apple seeds so that we would all be able to enjoy apples. She said the orchard there has 2,000 apple trees with more than 20 varieties of the fruit. They also have pears, plums and of course, pumpkins. Grace and her daddy being silly in the apple refrigerator. The first stop on the tour explained how the workers pick apples using a tall ladder to get up in the trees. She showed the kids the bag they use to collect the apples and how they just undo the bottom when it gets full and put the apples into a huge bin, which is later picked up by a tractor. Next, we saw how they sorted the apples from the big bins. Workers put the good apples into bags or boxes to sell to customers. They put the apples with bad spots into another box, and those apples are later turned into delicious apple cider. We even stopped to get some before we left. Mommy took a turn helping Grace pick apples. The kids also got to see where they make apple cider. Our tour guide explained how the apples are ground up and then piped into the building, where they are pressed, pasteurized and turned into cider. She even let the kids touch the remounts of the apple parts not used in the cider, which they thought was really neat. All smiles after we picked our apples! Our final stop before apple picking was a cold one. The kids got to check out the refrigerator where they keep the apples before they are sorted. She said on hot summer days that's a favorite spot for employees to work. Daddy helped Grace pick some apples too! As the teachers got ready to pass out the apple picking bags, we stopped for a class photo. Kyle parked Grace right by some of her classmates, and she just smiled. They are all very sweet to talk to her, and she just loves it. Grace and mommy had a good time checking out the goats! Then it was off to mommy's favorite part, picking apples! Grace's class got to pick a quarter peck of Fuji apples. I helped her with part and her daddy helped her pick a few. On Sunday in church, Pastor Joy talked about how her dad used to take her daughters to pick apples and he always managed to find the shiny ones just for his granddaughters. It would be years before they would realize he was just shining up the apples on his shirt, so Kyle made sure to get Grace her own shiny apple while we were there. After the apple picking, it was the afternoon class's turn for a tour, and Grace's class got to play on the playground equipment. Grace and I went over to say hi to the baby goats, which was fun. They we sat on some hay bales and watched the kids play. Her friend, Mia, even brought her a dandelion flower. After a picnic lunch with the class, it was time to head for home. And after all that fun, Grace was asleep in the van before we even left Carlinville. It was such a special day to celebrate fall with Grace's friends, and I hope we even get to make some apple pies with the fruit that she picked. I clicked the heels of my ruby red slippers together three times and said, "There's no place like home." Growing up, I was sure I wouldn't call Hilsboro my home when I was an adult. In high school, I used to cringe when people would ask me if I was going to come back and work at the newspaper someday. Absolutely not, was always my quick response. But after living in other parts of the country, and even the world, I came home more than ten years ago and never looked back. Kyle and I attended the Hillsboro Chamber of Commerce annual dinner on Thursday night, and I have to say it was an inspiring evening. As the presenters talked about the business award winners for the year, it got me thinking about Hillsboro. There are more than enough people to say that it's not the community it once was. This business is gone, the schools aren't as big as they used to be. Let's face it, some of those things are true. But that doesn't mean there's not hope for the present and the future of our community and our county. As I listened to the award winners talking about their businesses and why they picked Hillsboro as its home, I couldn't help but think there are still so many great things to come for all of Montgomery County. Because of those who continue to volunteer their time, hard work and dedication, there are countless great organizations that make this area great. Groups like the Montgomery County Cancer Association, local veterans groups, churches, 4-H, Boy Scouts, Girl Scouts and so many more that are always looking for ways to make the place we call home even better. And you know the best part, it only takes a little time and effort to make a big difference. When everyone works together, donating a little time and money here and there, the impact that it makes will outlive all of us. Take A Grace Filled Journey. When Grace was first diagnosed with INAD, people from all over the county asked what they could do to help. Initially, we turned all the offers down and said that Grace was well taken care of, but we appreciated their kind thoughts and prayers. Then we found out about a very promising research study at Washington University in St. Louis, MO. Since January, this community and beyond has helped to raise more than $60,000 for the study in Grace's name. And while that's a huge amount of money for this study, it's been done just a little bit at a time. Penny wars, bake sales, benefit ball games are just a few of the dozens of events that have helped to raise the money. In the end, it all adds up to make a huge impact in the lives of those kids with INAD. We are forever grateful to each and every person who has donated his or her time and money to make such a big difference. Time and time again, this county finds a way to believe in itself and believe in others. Just this past weekend, more than a dozen volunteers donated their time and elbow grease to do some clean-up work at the Broad Street Grill to help the owners get it back up and running after a fire. Volunteers brought mops and brooms to help with the clean-up work, and while there is still lots to be done, those hard working volunteers helped make a huge dent in the overall project. I think that's what inspired me the most at the dinner the other night. By ourselves, it seems insurmountable to make Montgomery County a better place to call home. However, if each of us donates our time and our talents, together, we will make a big impact in the future of the place we all call home.